YOUNG people from Donegal are helping to make the future better for their peers as part of Ireland's leading youth organisation Foróige. 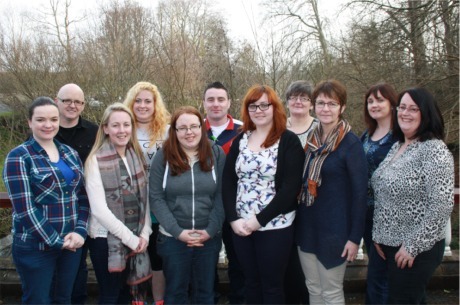 Eleven volunteers represented Donegal at the organisation's recent 46th national Volunteers Conference in Co Mayo. The 11, from Carndonagh, Donegal Town, Killybegs, Burtonport and Newtowncunningham, were among more than 220 Foróige volunteers from all over the country who took part in the 'Young People in 2016 – Shaping Ireland’s Future’ seminar. Foróige chairperson Michael Lynskey paid tribute to the volunteers across the country who give up their time to "help improve the lives of young people". “Last year, over 400,000 hours were given freely by volunteers in Foróige. It’s a staggering amount of time, energy and commitment. Donegal Foróige volunteers, from from left, Aoife Nielson, Christine Doherty, Michelle Gillespie, Shauna Gildea, Joanne Doherty and Marie Moyne. Back row, from left, Peter Lanne, Megan Jennings, Foróige regional youth officer Gary Duffy, Geraldine Bonner and Cecelia Sheridan. The group is pictured at the recent 46th annual Foróige Volunteers Conference. Our volunteers help equip young people with the skills, knowledge and attributes they need to lead the best lives that they possibly can and we are truly grateful," he said. Foróige currently works with 54,000 young people and 5,500 volunteers each year through a network of 600 clubs, 150 projects and national entrepreneurship, citizenship and leadership programmes.